﻿ Long term update: Stick or twist? The likes of Honda spend a lot of time refining their bikes so we as customers can get the most enjoyment out of them. Clearly I will never be able to build a bike as well as they can – but I do like to dabble when it comes to fine-tuning. 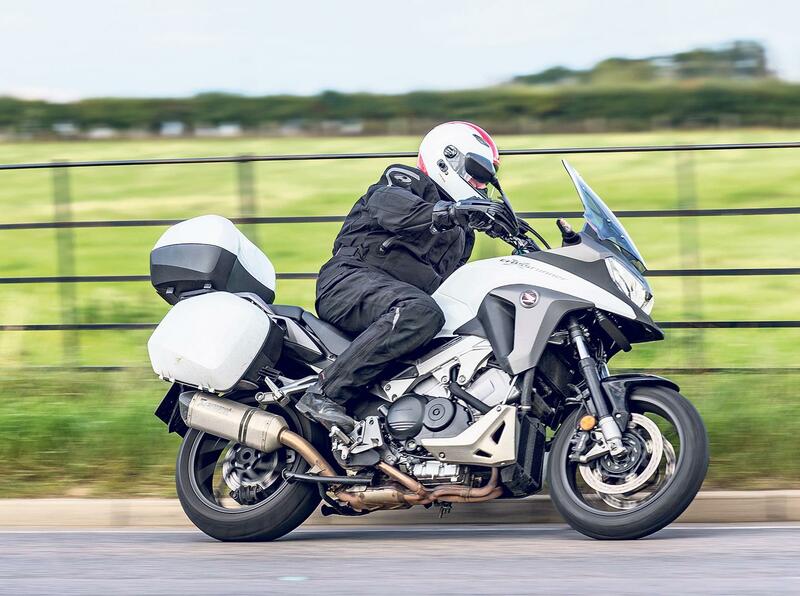 At £701.40 the official Honda panniers were more expensive than some of the aftermarket ones, but they win hands-down on how easy they are to take off and put back on. As they’re colour-coded they also tie in nicely with the rest of the bike. With a capacity of 29 litres each, they combine with the 31-litre topbox to give an overall capacity of 89 litres. I fitted a Powerbronze Flip screen (£80.25) to the Crossrunner. It was easy enough to fit, and it did take the wind off my upper body, but the problem was the turbulence, which was low with one helmet and horrendous with another. I have gone back to the original screen because at least any buffeting is about the same, whatever helmet I wear. I only had a Scottoiler eSystem (£210) fitted a couple of months ago and the chain is showing its appreciation by not going slack or turning that funny red colour that chains tend to during winter (oh yes, it’s called rust isn’t it?). One of the most popular questions has been: “What tyres will you fit next?’ After a good look at all the options, I have gone for a pair of Metzeler Roadtec Z8 Interact (£234 a pair). The most impressive thing I have found so far is the amount of grip I get in the wet, which is a real confidence-booster with all the dark soggy rides home I have been doing lately. Handling wise, they have really pepped the bike up, making it crisp, sharp and agile. I think these could be my best friends through the winter. These are a simple addition, but effective. The Acerbis X-Tarmac hand guards (£74.95) deflect the worst of the wind and rain away from my gloves, allowing them to get on with the job of keeping my hands warm. It’s well worth fitting a pair!Turns out I’ve got quite a good record – four out of five is not bad!